Excuse me sir, but I must tell you your hand is majestic. Your hand is fine, but it lacks a certain… magic. 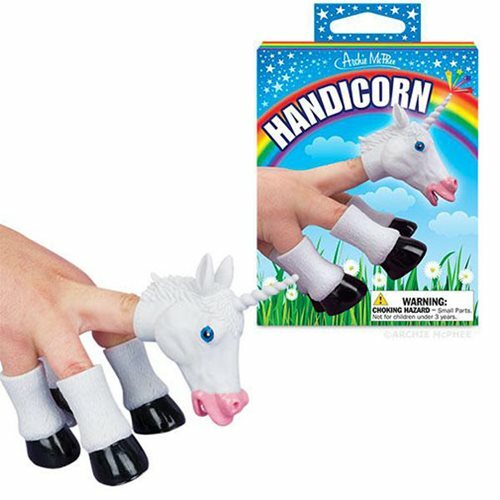 You need the Handicorn Finger Puppet! This set of five soft vinyl finger puppets (fourhooves and a unicorn head) takes your humdrum human hand and terrifically transforms it into a unicorn! The hooves are 2-inches, and head is 2 1/2-inches. Your hand is going to look majestic posed on a rainbow! Illustrated box. Ages 3 and up.